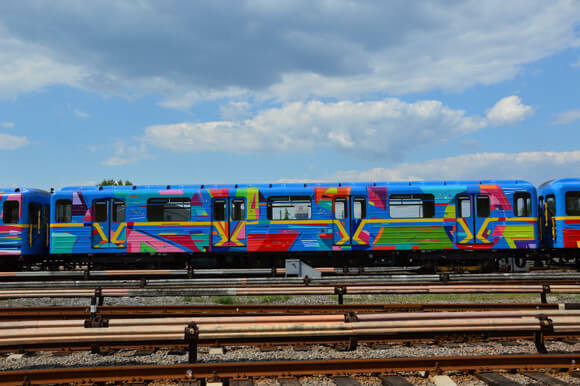 After painting a hotel train coach in Amsterdam, Kenor once again has embarked on a tremendous , authorized train decoration project.The idea of decorating a railway coach is not an unusual one. 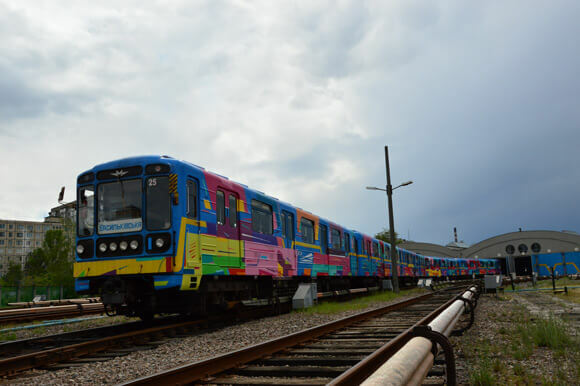 Preceding projects such as the “Proyeto Wholetrain” or the Thalis where Jonone, Sozyone, Seak, and Opak painted the country are proof that the compatibility between graffiti and train cars also exists on a legal level. 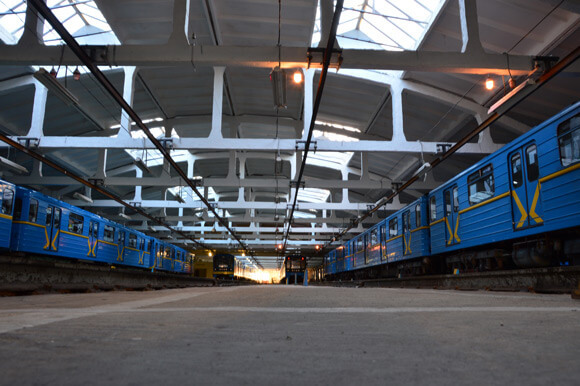 But in this specific case in Kiev, the charming old design of the Metrowagonmas and the aura of the legend that surrounds any old Soviet Union system makes this case particularly special… for Kenor and for us. 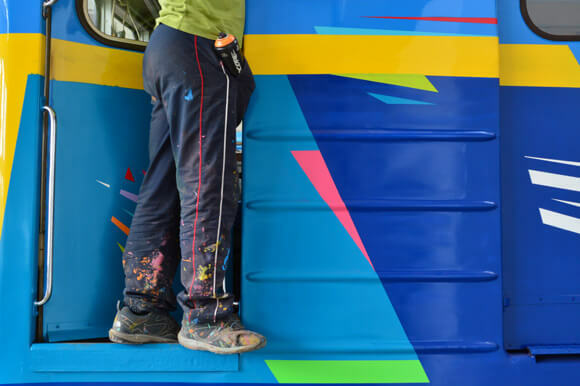 Its’s a contradiction that they chase you for painting trains but later on they ask you to paint one artistically. I have that same contradiction with myself. “Before painting we did an an end to end with pieces so that we could have photos of a piece on that train model. I painted six pieces and my assistant did four. We had some problems because not everyone that was guarding the layup was warned that we were going to paint. It’s a tricky place because it’s a military target and it’s guarded by the army. The stations are neoclassical in style and are very pompous, it’s crazy. In the city you see a lot of graffiti, especially silvers. But you don’t see any graffiti on the metro, not even tags. There was a total of five double sided cars. It took me 10 days to paint them. 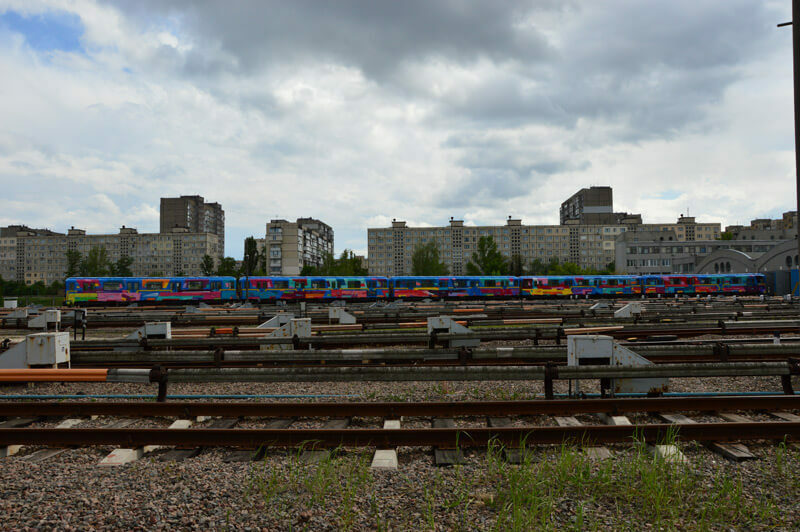 They also wanted me to paint the roofs, but I didn’t have enough time during the days I had planned to be in Kiev. I painted the first side inside of the layup warehouse and I could’t see the whole thing from a distance so I painted each coach with a different composition. On the second side I had more space and painted an overall composition. I tried to leave the blue color and the yellow stripe since it’s the design that the metro is known for. 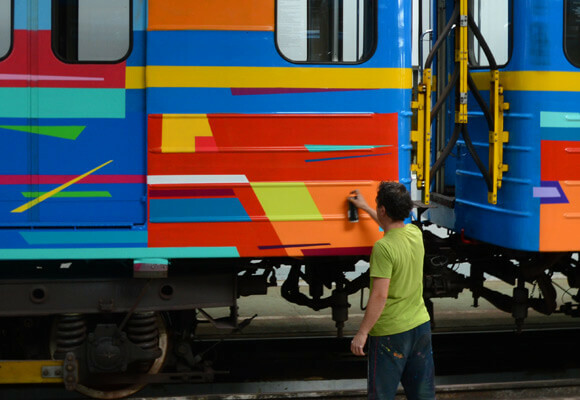 The train will run painted for 10 years, hopefully the paint will withstand the constant cleaning of the cars.